The Doctor and his companions are thrust into the war and politics between Richard the Lionheart and Saladin in the Third Crusade. A solid and engaging episode that sadly is incomplete, thanks to the loss of footage. Overall, with the combination of the visual footage and the book adaptation, this was a fun story that should have had the missing segments animated. The serial was originally presented in four episodes. The first and third episodes still exist, while the second and fourth are only available through an audio presentation. Unlike previous missing episode presentations such as The Reign of Terror, there is no animated sequence to accompany the audio presentation. The serial, audio and visual, is collected in the Lost in Time set, which also includes footage from The Daleks’ Master Plan and The Celestial Toymaker. 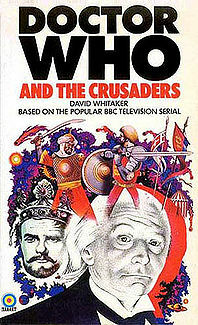 The best part about this presentation of The Crusades is that William Russell reprises his role of Ian Chesterton and introduces the footage in character. Like with the presentation of Marco Polo, I can’t help but feel sad at the lose of footage. While the audio is engaging, the visual footage was fun and delightful. Bonus: I always feel a little giddy whenever William Hartnell starts his adorable little giggle. Speaking of Hartnell, the fun chemistry that his Doctor displays with Vicki is touching. I’m a tremendous fan of Susan’s character but it’s fun to see a different approach with Vicki. Their interactions are some the best things about this visual presentation. There’s also a hint of the war within the Doctor, specifically with the use of violence. While later incarnations will discuss their role in various wars, specifically the Time War, there is still a vague notion of that the Doctor has merely escaped or ran away from his people. When he discuss war with the Earl of Leicester, there are hints of the Doctor’s understanding of the true impact of war and how it has scarred his past. This was the first serial that starred Jean Marsh, who would later play the character Sara Kingdom. Her portrayal of Joanna, King Richard’s sister is incredibly fierce and awe inspiring. While the part is small, Marsh brings a great deal of light and strength to the character. It’s fun to watch her stand her own against her brother’s plans. The beginning of the story describes life within the TARDIS, how the companions and the Doctor relax between adventures. As much as I appreciate the newer Doctor Who story lines, I find these little bits of normality between the Doctor and his companions to be entertaining. There’s something so beautifully domestic in these interactions. I think it might that within these first story lines of this Doctor we are able to see his growth in character and begin to appreciate how these companion interactions have affected his outlook on the universe. The book adaption really emphases a love story between Ian and Barbara; something that has only be hinted at in the past. It’s not distracting to the overall storyline but it can a little silly compared to how the characters interact on the screen. One of the things that I appreciate within this adaptation is the exploration of Barbara’s character, specifically her growth as a strong female lead as she continues her companion adventures. The book discusses her use of wit, humor, and intelligence as she adapts to new situations. There isn’t an emphasis on her physical strength, which is a refreshing take considering how more modern audiences use the term strong-female character as one who must have a robust nature to match the physicality of male action heroes. Within the past decade or so, the definition of strong female has shifted to include those of use who don’t fit into the action-packed category. Women can be strong outside of physical strength. It’s nice to see positive example of this with the description of Barbara’s developing character. Barbara doesn’t have to be the physical type to save the day; her strength comes from her mind and it is within this role that Barbara’s character is actively celebrated. Having said that, there was a part in this book that was never in the telecast; Barbara was lashed by the villain of the story. While it might make for a compelling storyline, I truly didn’t see why it had to be included in this adaptation or why it was even necessary at all. Keep in mind that Doctor Who was meant to be a child’s program; such plot devices seem barbaric to be included. Granted the show’s first episode did deal with potential killings in the era of cavemen. In her initial conversation with Saladin, she mentions past adventures such as The Web Planet, The Romans, and The Dalek Invasion of Earth. I hoping the missing episodes will turn up soon. Watching the Hartnell’s this year I’ve found that the historicals are the ones with the better plots. Here’s hoping. I’ve really have enjoyed this historical stories. I would love to see those missing episodes as well.